Thank you for your interest in MASST Associates, LLC. We kept our website simple because we believe that you are interested in quickly learning if we have something of value to offer that will help you achieve your mission and goals. Maybe you've got an exciting new opportunity or a nagging challenge that keeps getting put off because you just don't have the time or resources needed to address it. Maybe you're a nonprofit that's confused or frustrated by the charity rating organizations, or maybe you're a healthcare provider that's dealing with seemingly intractable reimbursement issues or you need help selecting and implementing an electronic health records (EHR) system. We can help. We hope that, after you have reviewed our information, you will send us an email or give us a call to let us know if the information on these pages is helpful and so that we can briefly discuss your particular needs and jointly figure out if MASST’s Managing for Results approach could be right for you. MASST is built on over 40 years of pragmatic / hands-on experience tackling important challenges in a variety of settings, including both giant and start-up organizations. Business consultants to nonprofit and healthcare organizations - providing both operations management and business development services to help organizations achieve their mission, growth and strategic objectives. 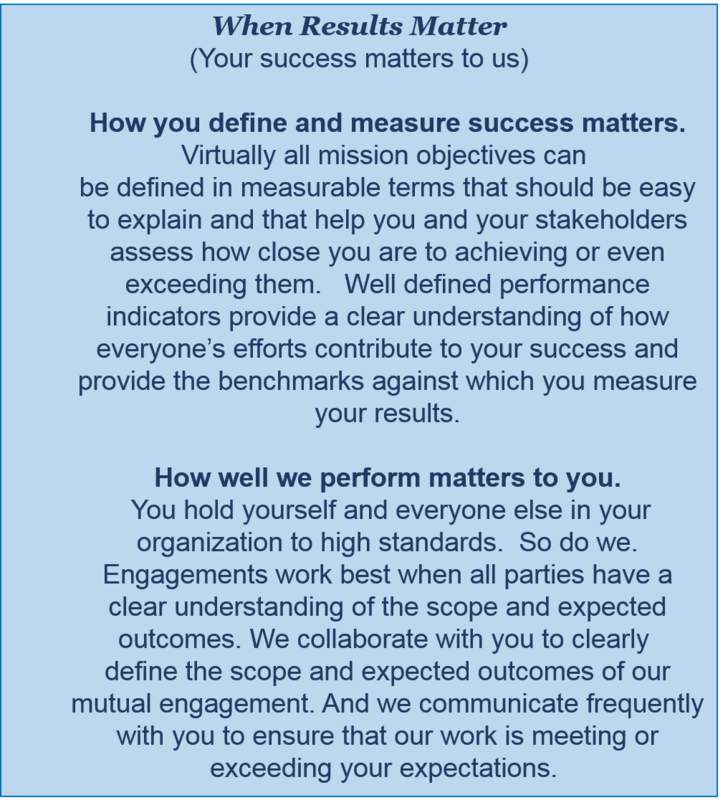 MASST utilizes its proprietary Managing for Results (MFR) process to address your specific issues and challenges. We employ a practical, easy to follow approach that can be taught to your team and replicated for future projects. MFR encourages open communication among all stakeholders. It facilitates meaningful and measurable outcomes through the implementation of a logical plan that focuses all stakeholders on the achievement of shared goals. Yours is a purpose driven organization. You exist to effect positive changes in the lives of your clients and the community(ies) you serve. Creating and maintaining predictable and reliable revenue streams are critical to your ability to meet the service needs of your clients and your capital requirements. Shared stakeholder values are critical to the successful realization of desired client and community outcomes. The increasingly competitive landscape for financial (investment) support advantages organizations that successfully differentiate themselves from other worthwhile organizations by documenting the measurable improvements they make in people’s lives. Pete is a seasoned executive with broad business leadership experience, including business planning, operations management, customer relationship building and business development. Pete has a proven track record of developing practical, innovative solutions to complex business challenges. Pete's collaborative approach engenders trust, cooperation and active participation among team members.